Raise the headrest as far as possible to use it in the high position. Check that it is correctly locked. Press button A and lower the headrest completely. Enter the rods in their housing and push down the headrest until it locks to use it in the high position. Check that it is correctly locked. 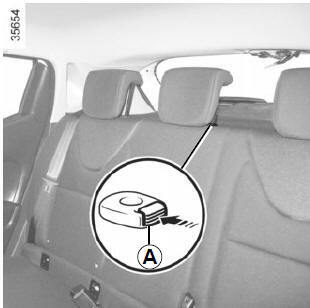 The headrest is a safety component; check that it is fitted and in the correct position. The top of the headrest should be as close as possible to the top of the head. Ensure that the front seats are far enough forward. Place the seat belts in their guides A. Press button 1 and lower the seatback B. To replace the seatback, proceed in the reverse order to removal. 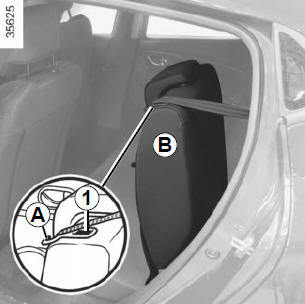 The configuration of the two-seat bench with the small seatback B pulled down, does not allow the central seat to be used as it would be impossible to buckle the seat belt (belt buckles inaccessible).